The UN40EH5000 LED TV is a direct replacement of the F5000 series from last year. This is a basic unit that covers most of the big areas of import. 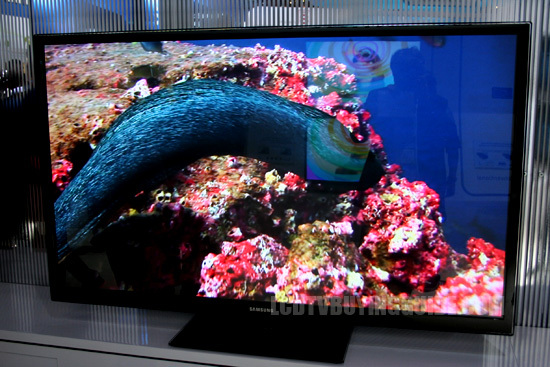 Price/Value is the main focus of this model and at $378 for a 40” 1080p LED TV that is quite an offer. We were surprised Samsung elected to include 1080p resolution with this model as most discount basic 32” LED models that compete are only 720p. However, the basic 60hz processing speed does apply even though Samsung applies their CMR (clear motion rate) technology to enhance processing speed (using LED edge it manipulation) to CMR 120. These are the big upgrades to the TV – 1080p and CMR 120. The UN40EH5000 may have a pretty plain appearance, but it does have that nice thin front bezel that looks must-have modern. The drawback to this model is the 3.7” depth – surprising in this day but not that big a deal if it's going on the basic square black plastic table top stand. The UN40EH5000 is definitely priced to please at a WOW price, $378 from Amazon. It competes very well with the best priced Sony, LG and Vizio models with only a 720p resolution. Overall, the picture is not great unless you are pumping in a beautiful broadcast HD picture signal. It will be a nice unit for a guest bedroom or office.